Thanks to all the residents who suggested a notice board in last weeks garden survey. What an excellent idea!? Of course - we couldn't afford a new one (have you seen the prices?!) - but some of us made an recycled notice board. First - we harvested all the estate agent signs from the entrance for the posts. Then we used a dumped desk top from the bin area. And - of course - we still have a few tins of the purple paint left from the Elevator Gallery. And .......... Voilla!! Thanks to Matt's W&C for help on heights & positions. Thanks to Tony for help constructing (maybe Family Mosaic will get us a better one some day). Thanks to whoever dumped the desk. Aaaaanyway - the deal is this - anyone can put up a community notice - providing you date it and only leave it up for 2 weeks. That way - we all see fresh & interesting notices up each time we walk past it. Please don't use it for any businesses that you may run - it's not too community spirited. So - if you have a bike to sell, know a great plumber, want to put on an event, suggest a picnic, etc - please put up a notice for the rest of us to see. We will also put up some of these blog entries - so that residents who don't have access to a computer - can see what we are all talking about! Brilliant!!!!! I fill out a questionaire every week, and nothing ever comes of it. I fill one out where I live, and the next week there's my suggestion standing proud at the entrance. Thank you! Thanks for the notice board. It was only when I saw it that I realised we were probably the only estate without one. Now we have a beautiful one. Thanks. Excellent idea! Just what we needed. When I filled out the consultation, I forgot to suggest this, but I've always thought it strange that we never had one. I LOVE that it's made out of those dodgy estate agent 'adverts' they stick up all over the place without even having any properties on sale in the area AT ALL! I say we collect as many as we can, and build trellises for the wheelie bin areas as well. Shows you how unobservant I am. I've been past it about 10 times now, and didn't clock it. Log in to my fave blog, and I see it for the 1st time. Thanks you guys, just what the square ordered. Hackney Wick Time Bank Successful Launch! 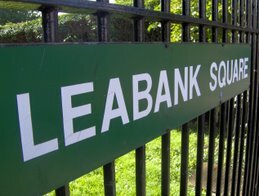 Leabank Square Reedbeds Coming Soon!! Towpath Tidy 2010 Such Great Fun!! Spruce Sprucing up Our Green.